The hydrangea’s reliably charming and large flowers make it one of our beloved summer-flowering shrubs of Southern garden. Many different species can be grown in our Louisiana landscapes. Most notably, the Bigleaf hydrangea or Hydrangea macrophylla, sometimes referred to as the garden hydrangea, is by far the most commonly grown hydrangea here in the South. Two other remarkable hydrangeas we grow are Hydrangea paniculata also known as the panicle hydrangea and Hydrangea quercifolia or the oakleaf hydrangea. One outstanding feature of oakleaf hydrangea is that as a native to the Deep South. Though hydrangeas lean closer toward the “easy-to-grow” shrubs, one significant disease is coming onto the scene due to the vast amount of rain we've had. Cercospora leaf spot is a common disease that attacks many different plants in our landscape, most noteworthy, the many species of hydrangea. Cercospora leaf spot is a foliar disease that rarely, if ever, kills the target plant. However, in severe cases it will cause nearly complete defoliation. 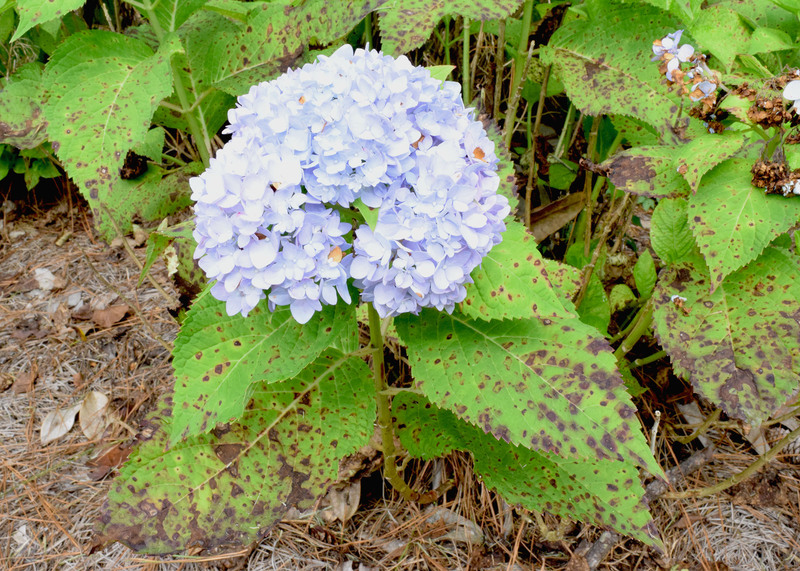 Mild cases of Cercospora leaf spot will cause hydrangeas to have unsightly foliage, can reduce the vigor of the shrub and possibly hinder flower buds from setting. When Cercospora leaf spot is present on the Bigleaf hydrangea and the panicle hydrangea, the disease tends to be scattered in small circular brown or purple spots, which first appear on the bottom leaves. These diseased areas are roughly 1/8 to 1/4 inch in diameter with a pale or light brown center and dark margins. The disease will then progress from the bottom foliage to the top. This pattern of leaf spotting is sometimes referred to as frogeye leaf spot. Oakleaf hydrangeas will tend to show a different disease patterns from the Bigleaf and panicle hydrangeas. Infected areas will appear angular in shape instead of round and will be dark brown to purple. Similarly, the disease will typically progress from the bottom and move towards the top of the shrub. Infected leaves that have fallen from the shrub can act as a source for spores of Cercospora leaf spot. When the shrub receives any kind of overhead irrigation or rain, this will cause splashing of the spores from the fallen leaves to the underside of healthy leaves. This will cause Cercospora leaf spot to continue to spread throughout the shrub. It is highly important to remove any diseased leaves that have fallen from the plant as well as hand picking highly infected leaves from of the plant. Be sure to discard these disease leaves in the trash, and do not put into the compost bin. Chemical control options of Cercospora leaf spot include spraying regularly with a product containing chlorothanil, such as Bonide Fung-onil, Ortho MAX Disease Garden Control or Daconil. Spraying will not take away the damaged area of the foliage but will prevent the spread to new foliage. Lastly, fertilize lightly with a nitrogen fertilizer to help encourage the new disease-free growth.